Distilleries de Provence Absente 55 Absinthe is a popular Vermouth and Aperitifs available from TheDrinkShop in 70cl to buy online. Visit TheDrinkShop for the best price for 70cl of Distilleries de Provence Absente 55 Absinthe or compare prices on our other Vermouth and Aperitifs products. 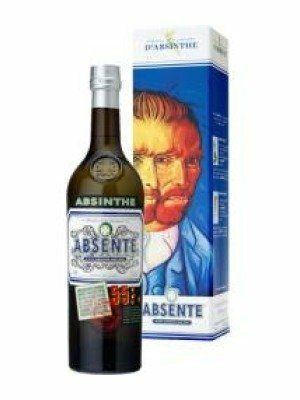 Produced since 1915, Absente 55 is an absinthe based product created using the classic wormwood plant, Thujone and a blend of aniseed essences including green anise, star anise essence, and grande absinthe. Absente 55 is infused with mint and lemon balm, cane sugar, and water giving a subtle aroma of absinthe blended with anise, mint and spices. All these ingredients are distilled together to give a traditional, fresh and spicy taste packed with flavour. Best enjoyed using the traditional method of drinking with sugar and water. Absente 55 has been produced in Provence, France by Les Distilleries et Domaines de Provence, founded in 1898. Distilleries et Domaines de Provence have been making aperitifs and liqueurs for over a hundred years and are known for their ability of maintaining the thousand year tradition of harvesting herbs for their active ingredients and aromas and preserving them through their products. Where to buy Distilleries de Provence Absente 55 Absinthe ? Distilleries de Provence Absente 55 Absinthe Supermarkets & Stockists. You can buy Distilleries de Provence Absente 55 Absinthe online in most retailers and find it in the Vermouth and Aperitifs aisle in supermarkets but we found the best deals online for Distilleries de Provence Absente 55 Absinthe in TheDrinkShop, DrinkSupermarket.com, and others. Compare the current price of Distilleries de Provence Absente 55 Absinthe in 70cl size in the table of offers below. Simply click on the button to order Distilleries de Provence Absente 55 Absinthe online now.